Very basic DVR smoke detector hidden camera model. Only useful for very short term deployment (under 2 hours) and lack of adjustable viewing angle is a big drawback compared to the other models. Standard DVR smoke detector hidden camera model with adjustable view. It does lack some features of the better PalmVID smoke detector models, however it is an excellent value overall. Best DVR smoke detector hidden camera model with adjustable view that is designed to be plugged-in to a wall outlet for full-time power, or to run much longer on battery power with up to 100 days of battery standby time. Best WiFi plus DVR smoke detector hidden camera model with adjustable view that is designed to be plugged-in to a wall outlet for full-time power, or powered by the rechargeable battery for up to 12 hours at a time. Best WiFi plus DVR smoke detector hidden camera model with adjustable view that is designed to run much longer on battery power with up to 100 days of battery standby time. * Maximum battery life depends on many factors. The actual battery life may be significantly lower. View more information on the product pages. Please call us or email to ask questions. 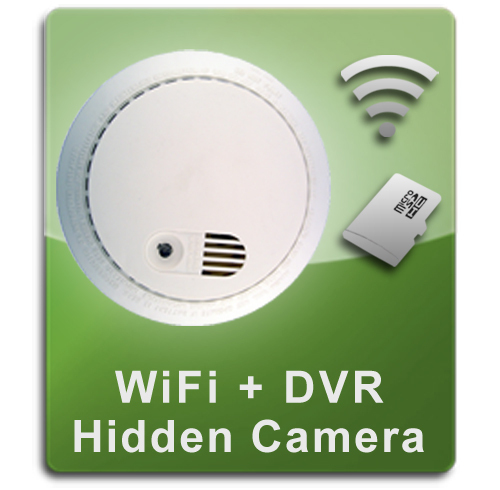 When it comes to buying smoke detector hidden cameras the best smoke detector spy camera model for your application will be different depending on if you intend to use it full-time as a long term professional surveillance camera or nanny cam compared to someone that may only need to use a smoke detector spy camera for a short term deployment. No matter what your needs are we have a complete selection of smoke alarm hidden cameras and spy cams so you can choose the best value model based on your needs. 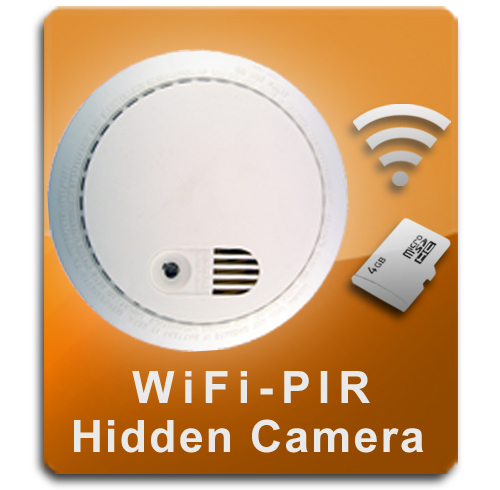 The biggest complaint that we hear from people about smoke detector hidden cameras is that most brands only have a camera that points straight out of the face or at a fixed angle out the side which makes it very difficult to install the smoke alarm spy camera in a location that produces the view that is needed. That is why we strongly recommend the PalmVID smoke detector hidden camera models that have adjustable camera viewing angles. The PalmVID smoke detector models that have user-adjustable camera mounts inside the smoke detector allow the camera inside the smoke detector to be aimed to get the exact view desired which makes them able to be mounted and installed in almost any location. Another thing to consider when shopping for smoke detector spy cameras is what power source will be used. Many brands of smoke detector cameras only have a small battery that only lets them work for a couple of hours. Some more advanced models have much longer battery times that can last for weeks or months by using PIR motion detection activated recording modes. If your application requires a model that is battery powered then we strongly recommend that the model you select has PIR (body-heat activated) motion detection recording (NOT video-pixel-change-based motion detection). The best smoke detector hidden camera models will also have the option for full-time wall power. We always recommend that our customers choose wall-power model hidden cameras whenever possible. Based on our many years of experience of selling smoke alarm nanny cams and spy cams we always tell our customers that while a smoke alarm hidden camera is a good choice for some applications it is not what we would recommend for many uses. Instead we would generally recommend that most users choose a hidden camera that is built-into an item that can be placed in a corner of the room which is the best location for a nanny or spy camera because it can give a full view of the room without any blind spots. We also strongly recommend choosing a hidden camera that is built-into a working item that can be plugged-in to the wall for full-time power so that batteries are not needed. There are several models we recommend that work very well in almost any room including the ► Air Purifier Hidden Cameras or ► Fan Hidden Cameras. If neither of those models will work for your application then there are many other hidden camera models built-into working electronic items available in our ► DVR Hidden Camera or ► WiFi Hidden Camera categories.